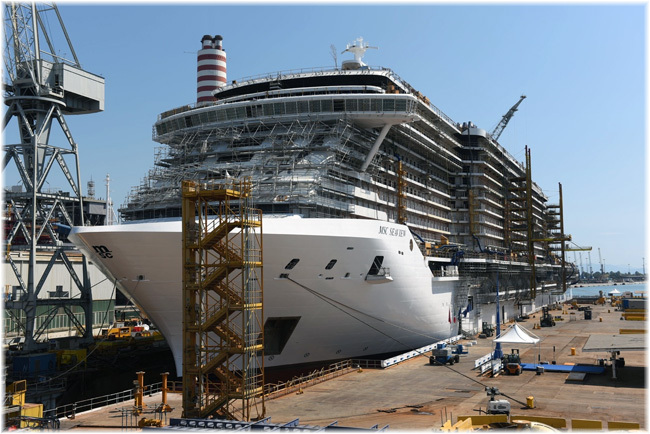 As MSC Cruises’ new MSC Seaside, first of a new class of cruise ship heads for her christening by Sophia Loren in Miami next week, we have a look at her on board offering. Montreal meanwhile reports a record cruise season, with 114,517 visitors. And Maersk Line’s December 1 acquisition of Hamburg-Süd sees the latter’s cargo ships leaving the passenger trades. 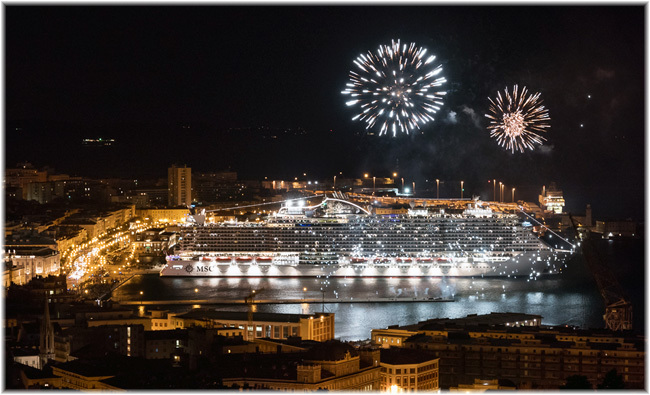 The MSC Seaside left Trieste, where she was built, on December 1 and Barcelona on December 6 and is now due in Miami on December 21, where she is to be christened by Sophia Loren. Loren has had a close relationship with MSC Cruises since she named the MSC Lirica in 2003, and she has christened every new MSC cruise ship since. The new MSC Seaside is innovative. Her 2,066 staterooms include 111 with inter-connecting doors that can be used for multi-generation family holidays or friends travelling together. More than 70% of her staterooms have verandas, with chairs in the standard cabins or loungers in the suites, overlooking the ship’s outdoor promenade on Deck Seven. There are twenty-eight luxury suites with a whirlpool on their balconies and fourteen grand suites. The exclusive MSC Yacht Club, has a 24-hour concierge, a private pool and large private Sun Deck for the exclusive use of Yacht Club passengers, plus two dedicated massage rooms and a dedicated gourmet restaurant and lounge bar. Staterooms, uniquely for a ship at sea, have recycling bins, with different sections for plastic, paper and food that are emptied at least twice a day. There are eleven dining venues including the two buffets, a first for MSC: the Marketplace Buffet on Deck Eight offers Mediterranean, American, vegetarian and wellness food while the Biscayne Bay Restaurant next to the Sun Deck pool on Deck 16, has classic American menus. The other complimentary restaurants are Ipanema and Seashore, with waiter-served American or international dishes, and there are four speciality restaurants with cover charges. Dining venues include the a la carte Pan-Asian Asian Fusion restaurant , the Sushi Food Bar for sushi, sashimi and tempura, and the Teppanyaki Restaurant with dishes such as teriyaki filet mingon. All three have menus created by Japanese-American chef Roy Yamaguchi. The other pay restaurants are Bistrot La Boheme, offering French fare, the Butcher’s Cut for steak-lovers and Ocean Cay for seafood. There is also a Venchi 1878 Chocolate Bar and Venchi 1878 Gelato & Creperie, showcasing some of the Italian chocolatier’s finest products. For entertainment, the Metropolitan Theatre stage offers four sittings of a Broadway-style show every night, with seven brand new shows. North American comedy also makes its debut with six different late-night shows on each cruise and there are nineteen bars around the ship, ranging from a Champagne Bar on Deck Seven in the Atrium to the Haven Lounge for cocktails and live music. There’s also a Sports Bar on deck eight, selling draft and craft beer and screening American sport, plus outdoor bars such as Aurea Bar beside the Deck 19 pool. The Port of Montréal welcomed 114,517 passengers and crew in 2017, a rise of 33% over 2016. Twenty-one ships representing sixteen cruise lines made fifty-two calls at the newly-renovated Terminal T1 at Alexandra Pier in Old Montreal and at Terminal T3 east of Jacques Cartier Bridge. 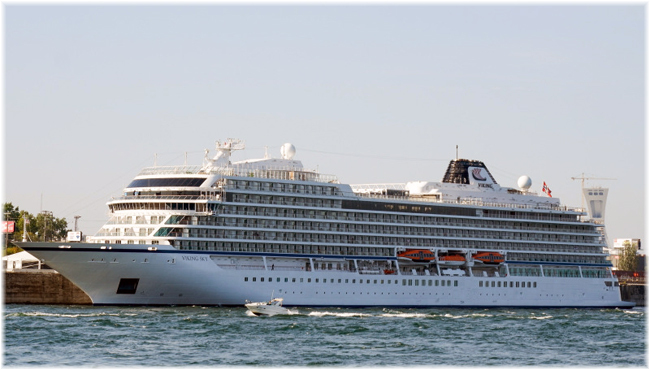 Three new luxury cruise ships visited Montreal for the first time this season, namely the 930-berth Viking Sky and Viking Sea from Viking Cruises, and the 596-berth Silver Muse from Silversea Cruises. The season opened on May 6 with the arrival of the 1,348-berth Veendam from Holland America Line and closed on October 27 with the departure of the 708-berth Seven Seas Mariner from Regent Seven Seas Cruises. This season also saw sixteen domestic cruises operated by the 812-berth CTMA Vacancier between Montreal and the Magdalen Islands. 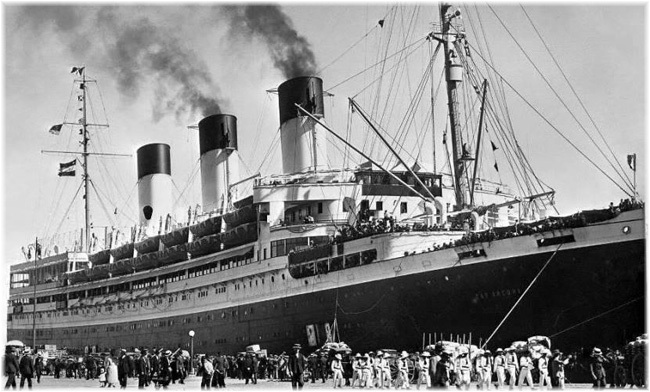 This route dates back eighty years to 1938, when the Clarke Steamship Company first built the 56-berth North Gaspé for dedicated service between Montreal, Quebec, Gaspé and the Magdalen Islands. Since 2011, the number of passengers and crew visiting Montréal has grown by more than 140%. So much so, that this season also underscored the importance of maintaining additional cruise ship berthing facilities east of the Jacques Cartier Bridge to ensure open berthing capacity in the high season. These were first opened as a temporary expedient at Piers 34-35 and 36-37 in 2016 while Alexandra Pier was being rebuilt. According to data collected by the Montréal Cruise Committee, clients are primarily from the US (68%), UK (12%), Canada (7%) and Australia (5%). 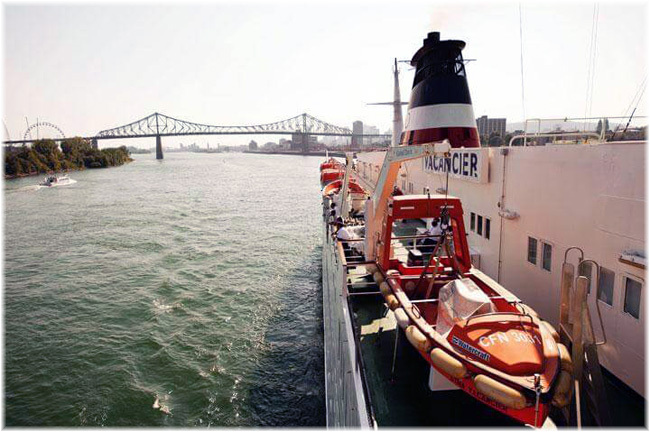 Nearly 70% of passengers who began or ended a cruise in Montréal prolonged their stay by an average of two nights. Next season promises to be just as busy with forecasts of approximately 130,000 passengers and crew. Effective December 1, 2017, A P Moller (Maersk Line) of Copenhagen took over Hamburg-Süd Group. While Hamburg-Süg Reiseagentur will continue its agency activities in the cargo-passenger trades, in an alignment with Maersk Line internal policy, Hamburg-Süd owned ships themselves will no longer carry any passengers. Passenger bookings on Hamburg-Süd owned ships to the end of 2018 will be honoured but no new bookings will be taken. While Maersk Line did carry passengers when it first began operations between the US East Coast and the Far East in 1928 and up until the late 1950s, the company’s main focus has always been cargo. One well-known Maersk passenger, however, was television presenter Michael Palin, who travelled on the Leda Maersk in November 1988 as part of the BBC series “Around the World in 80 Days.” in 1989. At the time, Palin crossed from New York to Felixstowe as a guest of Maersk Line. In another change to align Hamburg-Süd owned ships with those of new parent Maersk Line, the consumption of alcohol will no longer be allowed on board. 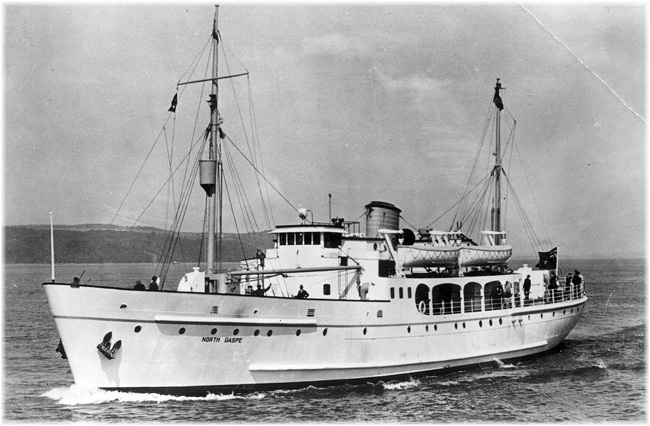 As well, some of the German-registered fleet may be moved to Danish or Singaporean flag. Hamburg-Süd Reiseagentur was earlier this year appointed passenger agent for twenty-five container ships operated by Reederei NSB of Buxtehude. These ships operate on charter variously to CMA CGM, Evergreen Line, MSC and Zim Lines and are heavily concentrated in the Far East and Transatlantic trades. Hamburg-Süd’s dedicated freighter travel bureau will also continue to represent a number of other German shipowners who continue to accept passengers, as well as accepting passengers in vessels that are chartered by Hamburg-Süd, including ships in the Europe-South America West Coast and North American West Coast trades and on routes between the USA and Australia and New Zealand. 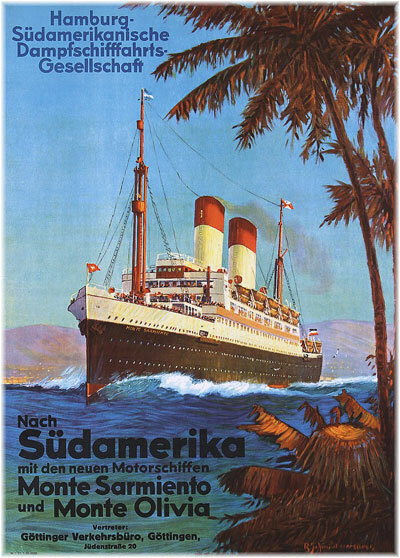 Hamburg-Süd’s participation in the passenger trades dates back to 1871 and over the years it has operated many passenger and cargo ships in the trades between Europe and South America. 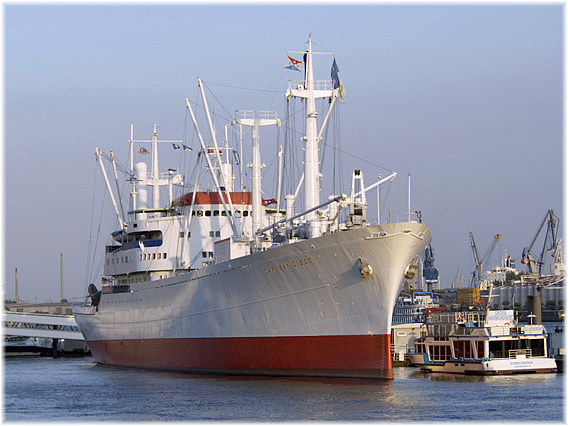 These days are remembered now by the 1961-built cargo-passenger liner Cap San Diego, which carried 10,000 tonnes of cargo and 12 passengers and is now preserved in the Port of Hamburg. Visitors are able to stay on board overnight.